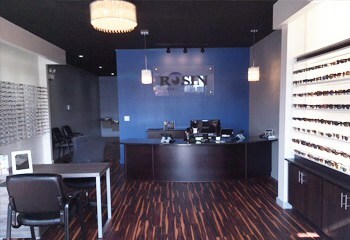 With over 80 years in business, Rosin Eyecare is dedicated to helping people of all ages with their eye care needs. To ensure your eyes are healthy and performing to their full potential, visit Rosin Eyecare in Andersonville for the best comprehensive eye exam in Chicago. Here and at every location, you will find skilled eye care professionals providing quality service while focusing on putting the patient first. Just off Ashland Avenue and at the Clark & Bryn Mawr bus stop 14792, our Andersonville location is convenient for new and returning patients. Similar at every location, you will enjoy your time in our office from the moment you walk in until you step back into the windy city. We make sure every patient has the best experience possible, just as the founders Joseph and Maurice Rosin envisioned when they opened in 1930. During your appointment at Rosin Eyecare, the comprehensive eye exam will not only provide you with your prescription, it will also educate you on the health of your eyes. Take the first step towards the clear vision you deserve and visit our office today. At Andersonville, and every Rosin Eyecare location, we offer an array of eye care services to provide the highest quality of care for our patients. From our wide selection of designer glasses and sunglasses to trusted brands of contacts, we have a great variety for all ages. Qualified eyecare professionals also perform LASIK, cataract procedures, and other eye surgeries for those in need of further treatment. Our comprehensive eye exam provides every patient with the knowledge of their eye health and what actions, if any, need to be taken. After your eye exam if you need vision correction, our skilled Andersonville ophthalmologists and optometrists ensure your glasses and contacts have the proper fit. With our wide variety of glasses at our office, there is sure to be the right style for every patient. Whether you are a new patient or a returning patient, we assure that everyone is greeted with a smile and leaves with a smile. Come see us at our Andersonville location today or schedule an appointment by calling (812) 241-8082. *From the South: Take US-41 N and continue onto N Lake Shore Dr. Follow N Lake Shore Dr to W Hollywood Ave. Turn north on N Ridge Ave just past Edgewater Gateway Garden. Take N Wayne Ave south and continue towards W Bryn Mawr Ave. Head west on W Bryn Mawr Ave past Pierce Elementary School. Turn north onto N Clark St where we are located next to AT&T. *From the North: Take N Clark St south past Rodgers Park Branch, Chicago Public Library. Keep heading south past the Chicago Police Department. Continue south on N Clark St towards Lake Shore Schools and we are next to the AT&T. Professional and clinically on target. My wife finally has received excellent care after being examined at Rosin. Highly recommend. Thank you. I loved my visit here. I had a great doctor and I highly recommend her. She made the visit easy and smooth but was very detailed in her work. She was very open to my suggestions and gave me lots of options as far as lenses and gave me advice on how to improve my eyesight. The best visit with an Optometrist that I have ever had! Copyright 2019 Rosin Eyecare All Rights Reserved.